This post is an original piece from guest author, Brandon Redlinger, and first published on DiscoverOrg’s blog on 3/27/2017. Brandon is the Director of Growth at Engagio, the Account-Based Everything platform that orchestrates human connections. He is passionate about the intersection between tech and psychology, especially as it applies to growing businesses. You can follow him on twitter @brandon_lee_09 or connect with him on LinkedIn. Account-Based Marketing. Account-Based Sales Development. Account-Based Customer Success. What does it all really mean? Are these just buzzwords to describe what we’ve always been doing? Recently, we sat down with our partners at Engagio to discuss their approach. Engagio combines all of these strategies into a strategy they call Account-Based Everything (ABE), which serves as the driving principle behind both their product and how they operate as a company. Our interview with Brandon Redlinger, Engagio’s Director of Growth, simplifies the details of how to implement ABE from account-based metrics to processes and team alignment. In addition to big picture strategy, Brandon provides tactics that teams can leverage right away. Check it out! Q: There’s a lot of AB acronyms these days can you give a quick run down of the differences between ABE, ABM, and ABSD? Account-Based Everything (ABE) is a strategic go-to-market approach that orchestrates personalized marketing, sales, and success efforts to drive engagement and conversion at named accounts. For more info on these specific terms, click on the thumbnails of these micrographics of the definitions created by Engagio. Q: What specific metrics can marketers track to prove the impact of ABE outside of leads generated? This topic itself deserves its own interview! When you’re taking an account-based approach, you’re not so much focused on quantity as you are quality. While leads and opportunities are important to note, it’s not enough for ABE. You need metrics that are suited to this specialized discipline. Since ABE is a fundamentally different approach, it requires different metrics – metrics that provide an account-centric lens to your measurement. When focused on leads, the top of the funnel becomes the 1st target to analyze. What’s the volume of known visitors entering the funnel? Then, a way to measure progress into the middle of the funnel, where the account is beginning to develop, becomes necessary. The longer the sales cycle and the more complex the deal, will increase the the need for more metrics that lend insights into an account’s progress through the funnel. That’s why engagement matters. By tracking how deeply the right people at an account engage with your brand, marketers have a quantifiable way of showing development through a potentially long nurturing process. Coverage – Do you know the people at your target account? Awareness – Do those people know who you are? Do they have a heartbeat with you? Engagement – Do they spend time with you? Are they engaged with you, your content or your brand? Reach/Focus – How many people are the right people? Impact – Do the efforts and ABM programs you’re running impact the sale? (This is about correlation, not attribution). In your question, you mention that thinking along these lines breaches SLA’s, but I would argue that if you’re transitioning to an account-based approach, a new SLA is needed. Agree on your objectives, activities, what metrics are tracked, and what commitments both sides of the Sales & Marketing house will make for each other. Q: How can outbound and inbound focused teams best come together to create a cohesive ABE strategy? The rise of Account-Based Everything has sparked a debate between the virtues of inbound versus outbound models. For the most progressive leaders in sales and marketing, ‘inbound vs outbound’ misses the point. Both are important to the growth of a B2B business, but they do very different things and require different processes and skills. Inbound is an always-on strategy that urgently responds to demonstrated buyer intent. Outbound is a thoughtful outreach strategy that crafts and coordinates targeted messages to named accounts. Use both together. 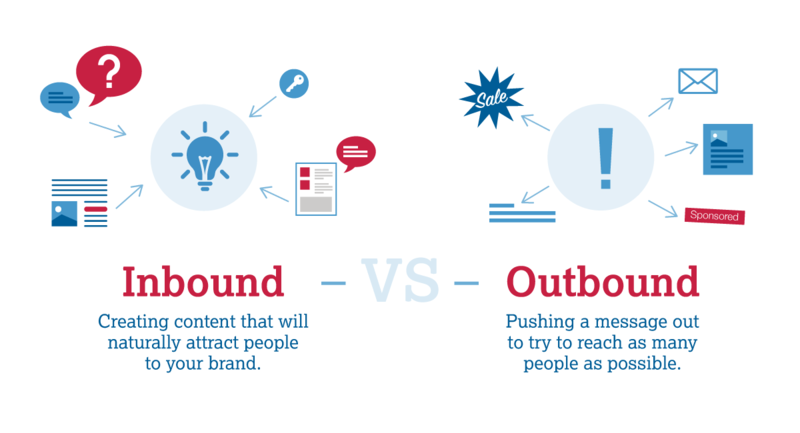 Some companies may rely more on inbound while other may rely more on outbound — it’s a spectrum. On one side you have the companies that have a lower ACV, say around $25K. You have broader target account definitions, and you have more of them. Generally, you can expect to see inbound influence about 50-60% of pipeline and source about 25-45% of qualified leads. On the other end, you have true enterprise accounts where your known universe is in the hundreds or fewer. Generally, you can expect to see inbound influence greater than 75% of pipeline but sources less than 10% of qualified leads. Q: With this new way of going to market with ABE and outbound strategies, how should Sales & Marketing teams strategize about allocating their resources? We think the best way to select target accounts is by looking at how many resources you have to invest. This depends on how you handle the different tiers or styles of ABE. A given enterprise account executive may only be able to handle a few Tier 1 accounts, but a corporate rep could probably handle a few hundred Tier 3 target accounts at a time. The right number of accounts is the number that your team can handle in a tier-appropriate way. Tier 1 – Each one gets deep research, a customized plan, personalized content, bespoke campaigns, and lots of one-to-one attention. Tier 2 – These accounts also get individual research, but perhaps it’s limited to a few key talking points for each account. These accounts may not get completely personalized Plays and custom content, but they should still get highly relevant touches based on their industry and persona. Tier 3 – This segment covers all the accounts that you want to target but don’t have the resources for personalization and customization. ITSMA calls this Programmatic ABM. It’s basically traditional marketing with account-level targeting. Across a sample of Engagio customers, the median number of accounts per account owner is 50. Quite a few Engagio customers have a lower number, 20 to 30 accounts per account owner, and quite a few have 100 or more accounts per owner. We know one company where management felt their reps could have 100 named accounts at a time – but they gave each one 150 accounts so the reps wouldn’t feel like their territories were too small. Q: How do you ensure that Sales, Marketing, and Customer Success are truly aligned? What can organizations be doing right now to make this happen? Start with an alignment workshop. This is where all three teams sit down together and discuss what an account-based strategy is and why you need to change the way you do business. The executive team should drive this. Next, orient your teams around a common objective. Agree on key metrics and Service Level Agreements (SLAs). Agree on your objectives, activities, what metrics you’ll track, and what commitments you’ll make to each other. Give everyone revenue responsibility, not just Sales! A big part of this is coming up with clear and consistent definitions. Make sure all teams are aiming for the right deals. Additionally, all stakeholders should have a seat at the table when defining the target accounts, especially Customer Success – they’re the ones who really know what a successful customer looks like. After that, you can begin to implement an account-centric data infrastructure, including things like lead-to-account matching. It is imperative to an understand pipeline metrics. Sales, Marketing, and Customer Success teams can then come to the table knowing exactly what is needed from a numbers perspective to hit their revenue goals. Once you have this plan in place, meet regularly. Review processes, metrics, and progress weekly. This helps to avoid silos. If Marketing, Sales, and Customer Success are using different tools to accomplish similar goals, start worrying. Integrated systems help encourage aligned departments. For us, the core tools are Salesforce and Engagio. Q: Can you give me some examples of how your Sales, Marketing, and Customer Success teams are working together? I think we’re very fortunate to have our teams very closely aligned. Jon Miller (our Cofounder and CEO, formerly the Cofounder at Marketo) gave us a huge advantage by doing this intentionally from Engagio’s beginning. Marketing then sat down with Sales and CS to decide how to deliver this content to customers, and that’s when came up with the PlayBook. Everyone documented their most successful Plays, sent it to Marketing, and they turned it into a killer piece of content. Now, we’re in the middle of rolling it out to customers and open opportunities. Marketing is hosting a webinar for customers, where the CS team is helping drive registration of their accounts to attend. Marketing is also hosting separate one for working opportunities, where Sales is driving people to the webinar with personalized invitations to key contacts at our target accounts. Notice what did NOT happen – Sales and CS did not go to Marketing and say, “We want this, let us know when it’s done.” Marketing did not create the content, then return to Sales and CS and say, “Here you go, good luck sending it out.” Every team was active every step of the way. And the result, a killer piece of content that drove results. Q: Where can people connect with you or learn more about Account-Based Everything? You can find me on most social channels, but I’m most active on LinkedIn. To learn more about Account-Based Everything, follow the Engagio Blog, or pick up our Clear and Complete Guides to Account-Based Marketing and Sales Development at Engagio.com/guides. And definitely check out The Engagio PlayBook – people are going crazy over it right now. I love geeking out about this stuff, so anyone can email me at [email protected] to chat more! DiscoverOrg welcomes guest bloggers who are experts and thought leaders in the fields of sales intelligence, inside sales, outbound marketing, sales processes, and more.